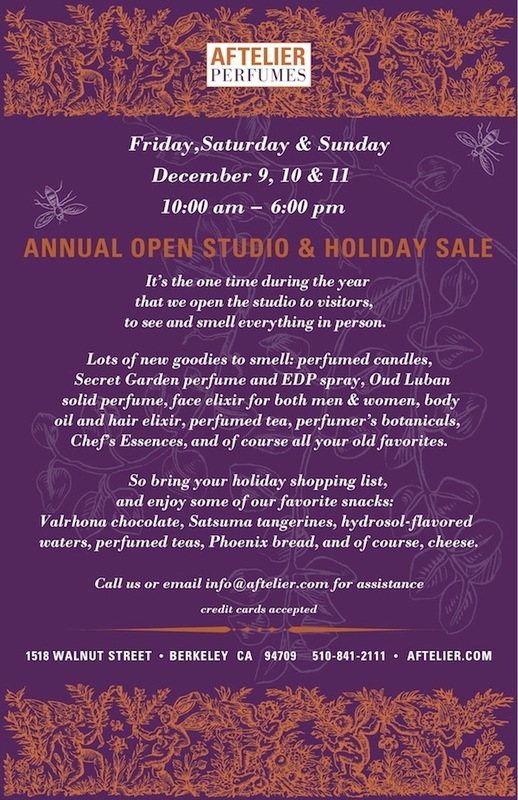 Mandy Aftel invites visitors to her Aftelier studio to see and smell everything in person. Her new Secret Garden perfume and EDP spray as well as her Oud Luban solid will be on display alongside several other scented products for both men & women (face elixirs, oils, perfumed teas, Chef's Essences and botanicals). For the occasion there will be delicious snacks offered as well, Valrhona chocolate, Satsuma tangerines, perfumed teas, Phoenix bread, hydrosol-flavoured water and of course cheese. 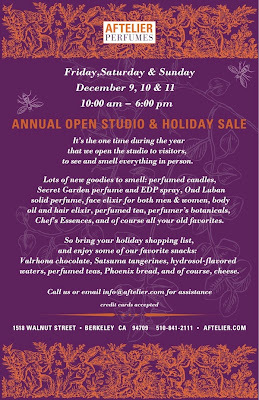 On Friday December 9, Saturday 10 and Sunday 11 from 10am to 6pm. Thank you Elena. So kind of you to put this up! I appreciate it. You're welcome. This is the time of the year when people are actually looking forward to reading about offers/shopping, so it wasn't off-putting to them in any way to post about a promo. Hope it proves to be a resounding success!